We are a local pool service company that offers regular cleaning services, pool pump repair, and pool equipment repair, in San Ramon CA. 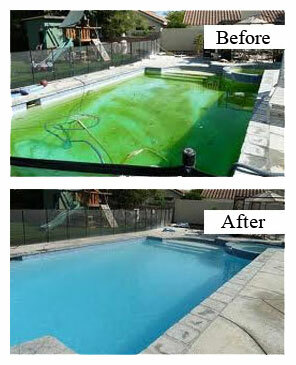 We offer four levels of pool cleaning services in San Ramon, each designed to cater to the needs of our customers. We are here to serve you with any level of pool service you require. Our services save you time and money and at the same time ensure you have a pool cleaning professional making certain you, your family and friends are never exposed to excess chemicals or chlorine. This inexpensive service is ideal for those that have the time to clean their pools, but want a professional pool service to handle the chemicals and chemistry of the water. In most cases this service is less expensive than when you do it yourself. One reason for this is because pool chemicals can be expensive unless you buy in bulk and when owners do buy in bulk they do not use the entire bulk before the chemicals degrade. A second reason is because owners can over buy at supply stores because they simply do not have the decades experience in perfectly balancing the water. If you are looking for someone to care for the chemical side of your pool maintenance, give us a call and lets talk about how we can help. The Partial Pool Service includes all of the necessary chemical balancing and adds brushing of steps, swim outs, and spa areas. This service also includes cleaning all of the baskets and filter bags and keeping the cleaner set properly with each visit, thus making certain the system is never over burdened which can lead to an expensive pool repair. In addition to basic cleaning and chemical balancing this pool service includes our professional looking at your entire system regularly to identify any maintenance or repair issues necessary. This is important because minor issues become major expensive problems if not repaired. Any minor problem, when identified, will be repaired at no extra cost. If it requires a replacement part we will perform the repair and let you know. If it is a repair that you would have preferred not to authorize, we leave the replaced parts and will reverse the repair, leaving no charge to you. We handle minor repairs in this manner because over the years we have found most customers want their pool service to be automatic and without interrupting their busy lives in any way. We are here to serve you and meet your specific needs. The Full Pool Service incorporates the Partial Service and adds skimming the surface with each visit. You retain all of the advantages of a professional watchful eye on your system, the chemical service, and the regular brushing. This adds full vacuuming to the Full Service. This extra element of regular pool cleaning is important to some customers and therefore we offer it as an extra to those that want it completed. All of our services are designed with the owner and end user in mind. Contact us anytime to discuss ways in which we can save you time and make certain your pool is always ready to enjoy. Your swimming pool is an important part of your home. We have the experience and capacity to handle any level of pool repair. From cracks and leaks to rebuilds of the surrounding areas impacting the pool we welcome the opportunity to inspect and review any problem with you. There are many times when a pool repair problem that a customer feels will be very expensive and yet we are able to handle it affordably. At other times there may be a small pool repair problem, but the cause of that problem may be from an improperly built deck, foundation, or surrounding area. The important thing to know is that we are a local company that is interested in customer satisfaction. In fact we rely on it for the survival of our business. As a result, when you call us, you can have the confidence in knowing that we have your long term interests in mind and will take the time to let you know about the problem, how it likely formed, how it can be fixed, and how to avoid it in the future. Sweeps, pumps, cleaners, filters, heaters, lighting, and accessories, we are here for you given any type of pool repair that you need. Our experts have hands on experience with every imaginable problem and manufactured system on the market. When you call us you can be confident in knowing that we will understand the repairs needed and do it right the first time. We have been in this industry for over two decades and there is never a pool repair that we find to be mysterious or too difficult. Never trust your repair to someone who has as their first option to sell you new equipment. Our business is service, repair, and maintenance. When you have any problem, we can help. Most pool owners have heard of salt water pools and how they enhance the swimming experience by softening the water and making it more refreshing, eliminating the harshness of extra chlorine on you skin and hair. If you are interested in a chlorine generator pool system, let us know and we can talk with you about how it works and the benefits. This system is roughly $1000 dollars installed and will pay for itself quickly. The water is so safe you can practically drink it. It is important to mention that though these are called salt water pools the level of salt is not noticed by the average person. Over 90 percent lower than ocean water and up to 50 percent lower than levels that a typical person can taste. The salt adds to the quality of the water and once you add it, you normally never need to add more unless you drain the pool. San Ramon is a San Franciso suburb located in Contra Costa County. As one of the larger Contra Costa cities it has a population of 74,378 all of whom live in the 17,552 housing units spread across the 18 square miles of incorporated area. Employment in the city is lead by Chevron and AT&T, both located at the Bishop Ranch Planned Business Park, followed by Robert Half International and the San Ramon Regional Medical Center, but combined these employers only account for a little over 6,680 people not all of whom live within the city. Median income for the city is high when compared to the State of California and the San Ramon Valley Unified School District is well respected with California High School being listed as one of the top 250 high schools in the nation. Higher education opportunities within the city include branch campuses of Diablo Valley College, the University of San Franciso, and the UC Davis Graduate School of Management. Some primary points of interest within the city are Old Ranch Park, Iron Horse Regional Trail, Forest Home Farms, Las Trampas Regional Park, and the Crow Canyon Gardens. Regular events that residents enjoy include the Fourth of July Picnic and Fireworks Show, the Memorial Weekend Art and Wind Festival and the October Primo's Education Run. San Ramon is a wonderful San Francisco area city that residents enjoy for both the amenities and quality of life as well as its proximity to other destination cities such as San Francisco.